A fake Flash Player upgrade is being used to cloak a nasty piece of malware. Be on the lookout for email that looks like a news item linking you to a video. The page then prompts you to download an ‘updated’ version of the Flash Player. Flash Media Server 3.5 and FMLE 3 have arrived! Yes, the day is finally here! Flash Media Server 3 and Flash Media Live Encoder 3.0 have been officially released. Flash Media Server 3.5 offers some powerful new features such as improved H.264 performance, “DVR” functionality, Dynamic Streaming, and HTTP delivery (Apache server built in). For more info, visit http://www.adobe.com/go/fms. The licensing costs have stayed the same, at $4,500 for Flash Media Interactive Server and $999 for Flash Media Streaming Server. The Developer edition is still free, and allows 10 simultaneous connections (can be used for commercial deployments). Flash Media Live Encoder has also been upgraded, with support for multiple bitrate encoding (to take advantage of Dynamic Streaming in FMS 3.5), an updated user interface, enhanced auto-adjust capabilities to accommodate fluctuation in your connection when encoding, and improved file and stream management including file “chunking”. Big day for Flash media — happy downloading! You may have noticed I’ve been pretty scarce for the past few weeks; as you may have guessed, Leela Grace has finally arrived. 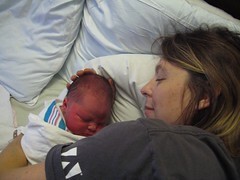 I went into labor on Wednesday, November 12th (good thing I decided not to attend FlashCodersNY that night!) and gave birth to “little” 8lb. 3oz. Leela at 4:33am. Everyone’s healthy (though sleep-deprived) and I plan to return to “active duty” early in 2009. I’ll try to keep up with comments and questions, but if it takes me a bit longer to reply, you’ll know why! p.s. Yes, that is an Adobe t-shirt… finally found a use for all those Xtra large shirts, hehe. Google has made a couple of big announcements in the past few days, all relating to new video features. Today they announced that Gmail will now support a free, cross-platform “standards-based” voice and video chat. You need to install a custom plug-in, and the feature only works with Gmail in your browser. The most interesting part to me is their use of H.264 encoding. We’ve been trying to get Flash to support that (or at least VP6) for some time now, but Adobe’s been reluctant to increase the size of the Flash Player to accommodate it. They are also working on live streaming on YouTube (possibly using a related plug-in?) This looks like it’ll be a service that competes with sites such as Justin.TV, Stickam, etc. The official launch is set for Nov. 22, so stay tuned for more info! Steve Wolkoff – Gone too soon. Steve Wolkoff, formerly of Adobe’s Flash Media Server team, was involved in a tragic accident this past weekend. A drunk driver took his life, and critically injured his girlfriend, Cindy. He leaves behind a legacy not only in the lives he touched with his open heart and good nature, but also in Flash Media Server, the project he fostered while at Adobe. Comments Off on Steve Wolkoff – Gone too soon. Flash 411 airs on Adobe TV! I’ve been working with Adobe on a series of video podcasts about working with video in Flash — the first episode, “Video in Flash: Crash Course,” has just posted. There are lots of other useful and interesting ‘shows’ there as well, so be sure to stop by AdobeTV to check them out. In the meantime, here’s Flash 411, for your viewing pleasure! Well, I didn’t run off to Aruba… I’m expecting, and the little one has been very, very demanding already! I’m finally able to eat again, and have been able to leave my apartment for more than 10 minutes at a time, so I will be rejoining the living now. Expect more posts and updates from me, and responses to the backlog of comments and questions I’ve received. Promise. And I WILL be presenting at FlashBelt in Minneapolis in June! For everyone who’s ever struggled to create a full-featured video player, or to just get a darn video to play back in Flash, this session is for you. Lisa will share her collection of tips, tricks, secrets, and little-known facts about working with video in Flash; hopefully making your life a little easier — and your video projects a bit flashier! Flash in the Can is always a vibrant, information-packed conference, and this year promises to be better than ever. (It’s also reasonably priced, which is a plus!) Here are the details… hope to see you there!